After months of procrastination, I have taken up going jogging again. Need to get back in shape and lose some weight. The frequent coffees that we Maldivians keep having everyday is making us carry a few extra kilos. It kind of creeps up on you. So, the last few years, I have tried my best to do some form of exercise, be it jogging, swimming or going to the gym. First, I tried the gym, but soon realized that it was not for me. I can not seem to stick to the schedule and I did not want to pay the monthly fees if I cannot make it to the gym on time for every session. I have heard that gyms give you huge discounts if you pay for 3 months or more, because statistically, you are not going to show up for all sessions, if at all! Later, I tried swimming. I went to go to the track area behind STELCO. When I started, I was just clumsily dog paddling across the track. After a few months I learned how to streamline my body, how to keep my head just below the water level and breath by turning my head sideways. Managed to learn all this by watching Total Immersion videos on YouTube. However, I was not able to practice these techniques for long. The track area where everyone in the island goes swimming got so polluted that I started getting rashes. My doctor made me stop when I got my second ear infection. That track area is heavily overused and miserably under-maintained. Not to mentioned all sorts of oils they keep dumping around there. My latest attempt at exercising is jogging. Actually, I used to go jogging quite regularly about two years ago. I stopped because people kept telling me that swimming would be twice as effective than jogging. Now that swimming is out, I am back jogging, and this time around, I plan to stick to it. One good thing about jogging is that I can listen my "motivational" music when jogging, it kind of gives me the extra boost I frequently seem need. It is nice. 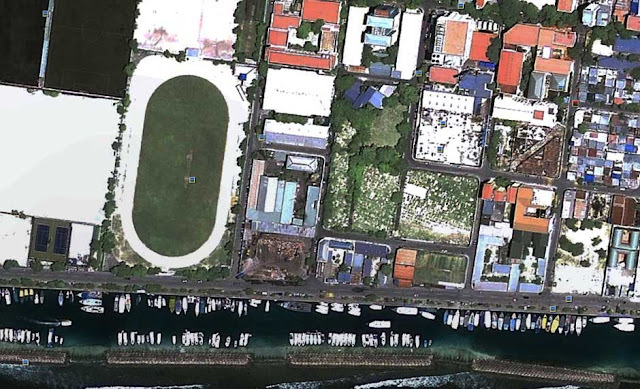 I jog around the outdoor cricket pitch in front of the sports complex. Back in the day, I could easily do at least 11 laps. Nowadays, I can barely do 9, that is on a good day. I am trying to slowly increase my lap count to 13. May be add a lap every week or so. I have it on good authority that 13 laps around the pitch is equivalent to one round around the whole islands of Malé. That is around 5.2 Kilometers. The general idea here is that these runs should whip me back in to shape in no time. I am hopeful, but it is not going to be that easy or that soon. It never is. I am also contemplating the purchase of some kind of monitoring device to keep track of my runs and workouts. I am researching Nike+iPod and Adidas MiCoach. I want to keep a record of my runs and analyze it in a visually appealing fashion. Those health websites have some good looking graphs showing all sorts of information which I probably will never need, but they sure look good. Though I have to admit that swimming got me the best results, I am going to keep up jogging. It would be nice if anyone of you decides to takes up jogging, or any form of exercise. Our blogger friend and personal trainer is of the opinion that exercise is good for us. He is usually right about these things. a good device will be the regular hajju flipflops with blue straps. after a jog you can measure how much has worn off the heels and jot it down on a 555 notebook that you could keep in a plastic bag to protect it from sweat. then after a couple of weeks you can draw a graph with your Oxford set of instruments (aka farugaal foshi) with your trusty compass and protractor. i wonder if climbing coconut trees helps shed weight. That is so true. Only very few people can actually stick to a Gym schedule. Lol. As for me, I like swimming :) Goodluck wid jogging!